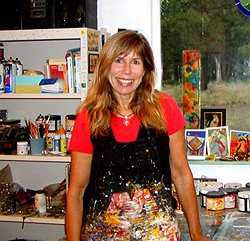 The colorful fine art paintings of Lindy Gaskill blaze with vibrant color and deep warmth. Inspired by nature and the energy that connects all things, Lindy creates whimsical artwork that radiates a peaceful joie de vivre (joy of life). Her colorful paintings of birds, trees and flowers blossom on the canvas, brimming with a sense of serenity and joy that seem to touch upon what matters most in life. If you like healing, inspirational art, then Lindy's art is for you! I'm delighted to share with you Lindy's whimsical paintings as well as this exclusive interview where she reveals the meaning and method behind her work. Lindy, where are you from? I was born in Seattle, Washington and I now live in Bend, Oregon. I've also lived in New York City and Portland, Oregon. I've been making things and creating art for as long as I can remember. I come from a long line of artists and consider myself to have inherited the artist gene. Why do you like working in acrylics? Acrylics are great for my process because I can layer the paint and work quickly because of their fast drying time. I like to put my paintings under the faucet and run water over some of the patterned marks and rub some of it off which to me, gives an aged look. I try to layer and create depth with the paint and that works well with acrylics. What is your favorite brand of acrylics? I can't say I have a favorite. I've used various professional brands. Right now I'm using the professional series that Utrecht offers. What is your favorite type of surface to paint on? I really like painting on a smooth surface so gessoed wood panels are great. I also like to use a super heavy water color paper with several coats of gesso on it. I am inspired by nature and animals and love whimsical things. You will find birds, trees, horses, flowers, leaves, seed pods, rivers, ponds, mountains and moons in my paintings. I love the idea that everything is connected and has energy. So you will see dots that connect things and spirals that represent energy. I also like to make things glow as if things have warm halos of light around them which also represents energy. What inspires you to create such colorful art? I like to surround myself with color because it lifts my spirit and makes me happy. I know that color can affect one's mood and I know I feel good when I look at color. I like to think that others feel the same way and that it can uplift one's spirit to see one of my colorful paintings. How long does it take you to create one of your colorful fine art paintings? I often have a few paintings going at one time so it is hard to judge. I may work on one for several hours and put it away while I work on another. I've been known to almost complete a painting and then not work on it again for several months. With that being said I recently finished six approximately 24" x 30" paintings over the course of 3 weeks. And then the other day, finished two 24" x 30" paintings in three days. So you can see it really varies. I spend a good portion of my day doing marketing too which is why it can vary depending on how much time I spend on it. How do you want the viewer to feel when s/he looks at your colorful fine art paintings? I hope my paintings can help create a little joy in people's lives when they view them. I've been told by some people that they notice something different each time they look at one. I like that it can hold someone's attention that way. But I like the viewer to create their own story when they see something in them they relate to rather than me telling them what it is about. I like hearing what other people see or feel when they view one of my works. What techniques do you use in your art to evoke that sense of joy in your viewer? I mainly use blue, yellow, red, black, white and a purple paint to mix all the rest of my colors. In this way, because the colors are all made from this limited number, they are all related. I've been known to also buy a turquoise when I want a turquoise brighter than one I could mix. I think using the black line to hold in the color also helps make them appear brighter. I also spray my paintings with a gloss acrylic varnish when they're finished that makes the colors pop and enhances their luminosity as well as protect the paintings. Do you have any advice for people who are learning to paint with acrylics? Experiment and experiment more! Try different mark making. I've taken some classes where we used everything but a paint brush as our tools to make marks. Try mixing the acrylics with different things to see what it will do. There are gels and matt mediums that can be mixed in to effect the paint. Try spraying water into the paint with a spray bottle or drop rubbing alcohol into it and see what that does. One can try stamping into it with patterned cloth or sponges to create texture. There are so many things you can do with acrylics to create texture and line and images. It is this experimentation that one eventually finds what they like and can create their own style of painting from. Many thanks to Lindy Gaskill for sharing her art and thoughts with us! You can see more of Lindy's colorful fine art paintings at her website, and read more about her life, her inspirations, and her creative process on her frequently-updated blog. 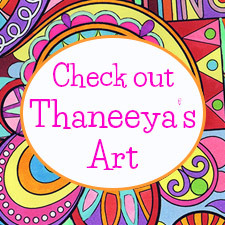 You can purchase Lindy's original colorful fine art paintings and prints at her etsy shop. Wanna learn more about acrylic painting? Check out the Acrylic Painting Table of Contents to explore all of the acrylic painting info and tutorials on this site. Get inspired by other Featured Artists! Discover a world of whimsical art, along with tips for making your own whimsical artwork.